Kids learn some of the adaptations that night animals have like big eyes, eras and whiskers. 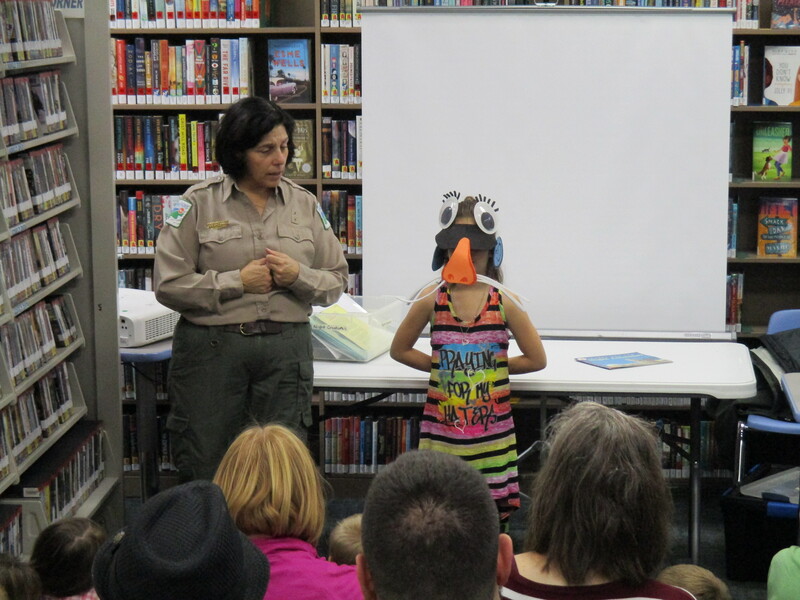 Lake Metroparks introduced us to some of the nocturnal birds and mammals that live in the Kevin P. Clinton Wildlife Center at Penitentiary Glen. The center receives and rehabilitates nearly 2,000 injured or orphaned animals each year. Those animals include rabbits, songbirds, opossums and more—even peregrine falcons and bald eagles. (However, they don’t take skunks and raccoons because they’re rabies threats or coyotes because they’re not originally from Ohio.) Most of their rescue animals eventually return to the wild. However, some of their animals are too injured to return and they become animal ambassadors. 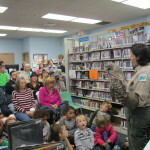 We were fortunate enough to meet some of their nocturnal animal ambassadors earlier this month at our Headlands Branch. Marilyn Levand from Lake Metroparks explains how screech owls (like Rufus) adapted to nocturnal life. Hemlock, a barred owl, greets the crowd. We met an opossum named Captain, a screech owl named Rufus, and a barred owl named Hemlock. We also learned some fun facts about each animals. For example, opossums are the only marsupial—that means they carry their young around in a pouch—native to North America. Also, owls can turn their heads 270 degrees. That’s nearly all the way around! 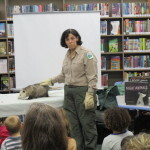 Marilyn Levand from Lake Metroparks also explained what it takes to be a nocturnal animal that hunts (or avoids being hunted) at night. Visit the Lake Metroparks website for more info on the denizens of the Kevin P. Clinton Wildlife Center. 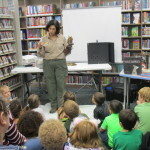 This entry was posted in Uncategorized and tagged Headlands Branch, Lake Metroparks, Mentor Public Library, nocturnal animals. Bookmark the permalink.